With the weather being very generous with sunshine recently we've finally been able to try out a product that was sent to us a little while back but were never able to make use of until now. I've always loved BBQ's since childhood I think that goes for everybody too. They are a summer must! 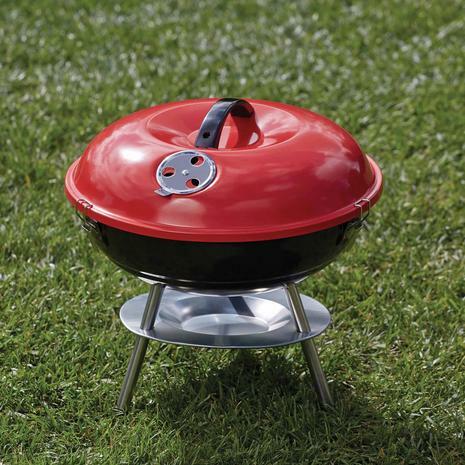 We were kindly sent the Portable Kettle Charcoal BBQ, Which retails on the Dunelm website for £9.99. Its made from steel which means its seriously durable and easy to wipe down after use. It is lightweight (11kg) so is easy to bring about with you. If your going to a caravan park, camping or just fancy a quick barbie in the garden with a few family and friends its simply perfect.. It has a detachable lid incase the weather decides to turn on you, and a handle for obvious safety reasons. Being in England the likely hood of rain is very possible. so will come in mighty handy I'm sure. Upon building the BBQ I was abit overwhelmed after id opened the box to see lots of little screws and bolts. There were instructions provided of course and after reading them it looked pretty straight forward. I let Reese entertain Penelope while I got my DIY thinking cap on. It says building time is approximately 30 minutes but i'll have you know...I did it in around 15 minutes, it was so easy! I've not built much in my time so I was pretty darn proud of it. When we were asked to do this review for Dunelm I wanted to put a different spin on things. I've always been to BBQ's in which they are your usual fairly standard family get together's with tables, chairs, knives, forks, and plates. I wanted to create more of a sit down on a blanket on the grass back to basics BBQ picnic environment asif it was stop and cook. We thought we'd try it out and put some burgers on the barbie and a little fruit on the side. I cant/wont lie and tell you that it was a smooth sailing BBQ experience because in actual fact it started off quite hilariously, and not due to the barbecue itself either. This was not just the first time we'd got to use the Portable Barbecue. It was the first time me and Reese had ever used a BBQ together without 'parental supervision' meaning we've never been in charge of one ourselves. Being overconfident thinking we knew exactly what to do we put the coal bag into the BBQ lit it and was very impressed with the flames. (Note: You must make sure all the air vents are open on the BBQ before lighting) I think it was about 5 short minutes later Reese called for the burgers to go on, I didn't even think twice and I let him put them on the grill. Once I heard the burgers sizzling to a pulp I shouted 'AHHHH, I've just remembered we're supposed to wait until the charcoal is covered in grey ash before putting the food on.' #FAIL.The flames were literally attacking Reese's eyebrows and arm hair as he battled to get the burgers off to dispose of them. What were we thinking! Once removed we waited for the coal to become ashy and for the flames to settle. We tried again and placed our last remaining burgers onto the BBQ. Success, we'd finally done it. They tasted just as they should and we had a lovely lunch together. As barbecue novices go I'd say apart from putting the food on to soon, we did really well. We had set up and successfully lite the BBQ. We cooked the food correctly in the end and we had a successful meal. It was so easy to do all in all, and next time will be even easier because its already built and set up ready to go. All you'd need to do is add the coal and have abit of common sense about you. Doh! Oh it's so cute and for £9.99 it's an absolute bargain too.